MIAMI—While passengers in the economy cabin watched the standard preflight safety video Monday, United Airlines flight attendant Kim Walters quietly informed first-class ticket holders aboard Flight 1173 of the location of the plane’s actual emergency exits, sources confirmed. “Ladies and gentlemen, if you’ll please give me your attention for a brief and important announcement about the first-class-only safety features of our Boeing 757 aircraft,” Walters reportedly said in a voice just above a whisper, explaining that in an emergency, the airline’s most valued customers should ignore the escape path lighting along the aisle and instead follow the green lighting on the first-class seatbacks to a secret hatch just behind the forward lavatory. 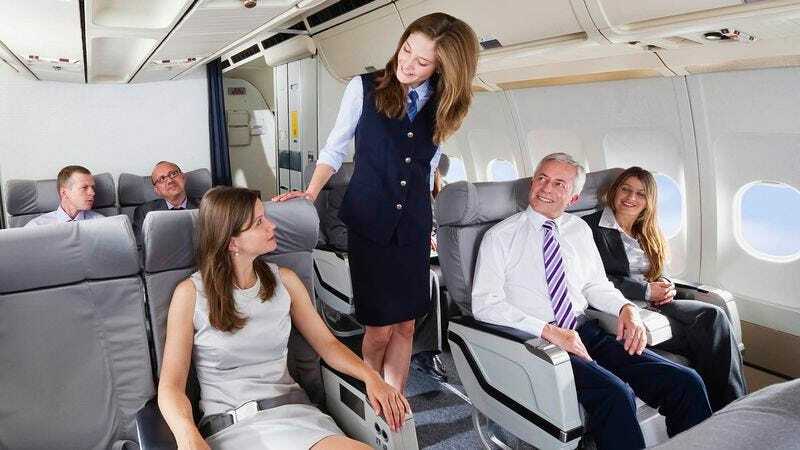 “For your convenience, in the event of an emergency, a bulkhead will automatically close and seal off the first-class cabin from the economy cabin, giving you ample legroom while deplaning. In addition, should we experience a sudden loss of cabin pressure, ignore the oxygen masks that drop from above and instead use the real ones located underneath your seat, right next to your emergency parachute.” According to reports, Walters then showed each passenger how to use their personal flotation raft, which she said comes with two weeks of gourmet rations, over 120 movies and TV shows, and is “[theirs] to keep” in the event of a water landing.